United Bank for Africa (UBA) Group is one of Africa’s leading financial institutions offering banking services to more than seven million customers via 750 branches in 18 African countries. With further offices in New York, London and Paris, UBA is connecting people and businesses across the world through retail and corporate banking, innovative cross-border payments, trade finance and investment banking. 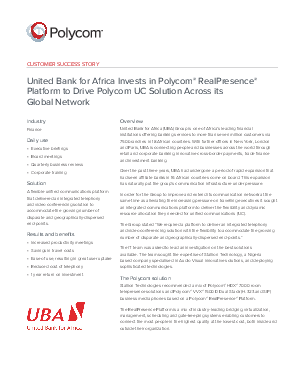 Over the past three years, UBA had undergone a period of rapid expansion that had seen affiliate banks in 16 African countries come on board. This expansion has naturally put the group’s communication infrastructure under pressure.